JCU’s excellence in marine and tropical biology continues to shine with a JCU fish ecologist to receive the premier prize in Australian marine science, it was announced this week. Professor Geoffrey Jones (pictured above) will receive the 2014 Jubilee Award of the Australian Marine Sciences Association (AMSA) at their annual conference in July. The award honours excellence in marine research and is presented to a scientist who has made an outstanding contribution to marine research in Australia. Professor Jones, from the School of Marine and Tropical Biology at JCU and a Chief Investigator in the ARC Centre of Excellence for Coral Reef Studies, conducted pioneering research on reef fish ecology. 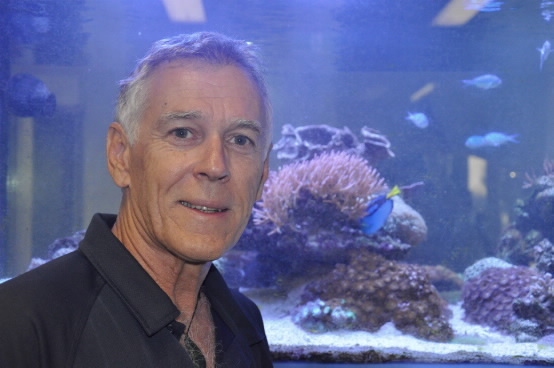 Professor Jones has made important and unique contributions in the areas of larval connectivity, ecological interactions, and the dynamics of reef fish populations. His research has had a major impact on the understanding of how marine fish populations function and has also influenced the design and management of Marine Protected Areas in Australia and worldwide. Associate Professor Sabine Dittmann, National President of AMSA, said the award recognises that Professor Jones pioneered the development of new methods to directly determine where the larvae of reef fishes go. “He was the first to show that fish populations can have high levels of self-recruitment and his ground-breaking research has provided insights that have changed paradigms in reef fish ecology,” Professor Dittmann said. Professor Jones said he was astounded at the recognition. “It is humbling to be counted among the remarkable recipients of this award, several of whom have been of huge inspiration to me,” he said. Professor Philip Munday from the ARC Centre of Excellence for Coral Reef Studies also highlighted the importance of Professor Jones’ work. “Geoff’s research has changed the way we think about connectivity of marine populations, and the techniques he has employed have become the gold standard in this field of study,” he said. The Jubilee Award will be officially presented at the 2014 AMSA Conference “Investigating our Marine Nation” in Canberra in early July. AMSA is Australia’s leading association of marine scientists with over 1,000 members spread across all states and territories (www.amsa.asn.au).